Sod is one way to get a beautiful lawn quickly. But, before you have a shipment delivered, be sure you understand what is required for successful installation and early care. Laying sod is a great way to have a lawn without the wait, but don’t kid yourself—it’s a big job. If your lawn is sizeable, you may want to accomplish the job in two phases. Begin by redoing the worst or most visible lawn area, and tackle the other half next year. This keeps the job manageable and makes the frequent watering feasible for homeowners who do not have in-ground sprinkler systems. Laying sod is best done in the fall or spring in the North and in the spring in the South. Plant the sod during cool weather because planting it when warm will subject it to burnout. Do not plant sod later than one month before the average date for the first fall frost. 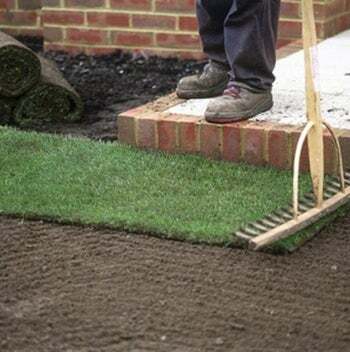 It’s important to give the grass time to establish roots before cold weather sets in. Mechanical removal of your old lawn will be the fastest and easiest way to get the job done. However, for small lawns, a grape (grubbing) hoe is a terrific tool for removing turf. For large lawns, consider renting a sod cutter. It slices under the grass, enabling you to pull up strips of old turf. Make the job easier by cutting sod while the lawn soil is moist. Now is the perfect time to fix any existing grade problems. Although grading often requires help from a landscaping contractor with heavy equipment, you can fix minor problems yourself. The first rule of grading is that the ground should slope away from your house in all directions so that it drops at least 2 or 3 inches every 10 feet. The finished grade should also end up matching the level of existing features, such as walkways and patios, as well as areas of established lawn. The proper way to regrade is first to remove the topsoil from the problem area. Make adjustments to the subsoil by scraping away high areas and filling in low areas. Then spread 2 inches of the reserved topsoil over the subsoil, and till it to blend. This will help prevent drainage problems between the two layers of soil. Next, spread the rest of your topsoil, which should make up at least another 4 inches. If you need to add topsoil, buy a loam that’s free of debris, such as roots and stones. It should also be free of weed seeds and pesticides. A landscaping rake is the best tool for working topsoil to the proper grade if you’re doing it yourself. Have your soil tested to see what amendments—fertilizer, organic matter, lime- or sulfur-based nutrients—may be in order. TK upon results of a soil test. The typical recommendations for every 1,000 square feet of new lawn include about 2 pounds of actual (elemental) phosphorus and potassium, 50 to 100 pounds of lime (in areas with acid soil), and 3 to 6 cubic yards of organic matter (such as compost or peat moss). Recommendations will vary depending on your soil’s nutrient, organic matter, pH levels, and your particular soil type. Ensure an even application of amendments by dividing the recommended amounts in half and applying half while walking in one direction and the other half while walking in a perpendicular direction. Once you have applied the amendments, till them into the top 6 inches of soil. Rake the area to be replanted until it’s smooth. Remove any stones and vegetative matter brought to the surface during tilling. Once you’re satisfied, water the ground and check for puddles. Puddles show where depressions remain. When the soil dries, remove soil from high spots to fill the depressions. Next, roll the prepared soil to provide a firm base for the sod. Fill a lawn roller about one-third full of water and roll the soil until your footprints are no deeper than 1⁄2 inch. Complete planting preparations by watering the area thoroughly two days before planting. Check to be sure the soil is moistened to a depth of 5 or 6 inches. Begin by applying a starter fertilizer high in phosphorus, such as 2:1:1 or 1:1:1 ratio. Then lightly water the area where you will begin. Be prepared to begin work soon after your order is delivered. Sod can go bad quickly, especially if it begins to heat up or dry out. Have the pallets delivered to a shady spot. If you can’t start right away, unroll the sod and keep it moist. Lay sod over one section of lawn at a time. Begin by laying full strips along an outside edge (such as the sidewalk). Start with a straight row to reduce the amount of cutting and fitting you’ll do later. Work toward the opposite edge of lawn, usually the edge by your house. Use a sharp-bladed knife or sod-cutting tool to cut as required. Make your last row a full-width strip, even if it means cutting the preceding row narrow. With contoured borders, overlap the border with sod, and trim away the excess later. Again, try to install all the sod the day it’s delivered. If you have sod left over, unroll it in a shady spot, water it lightly, and use it the next day. If you’re installing sod on a slope, start laying the sod at the lowest point. Stake each piece in three places to prevent slippage. Stakes should be equally spaced and set in from the sod strip’s edges by at least 6 to 8 inches. 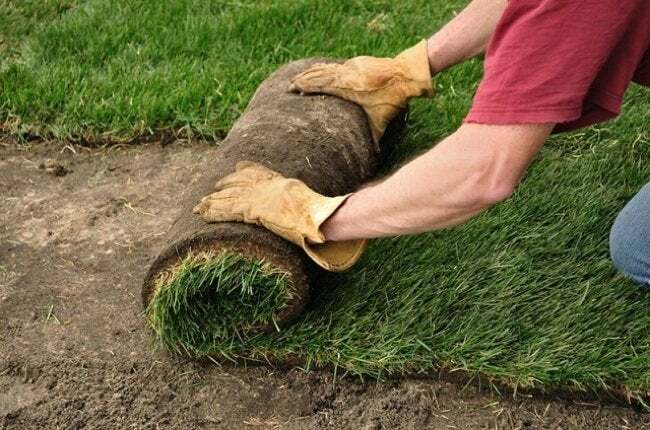 After installing the sod, firm it with a roller that is one-third full. If the roller is too heavy, it may cause the sod to slip. In hot weather, lightly watering the sod prior to rolling will also help prevent slippage. Follow rolling immediately with a thorough soaking—to a soil depth of 6 to 8 inches. Once sod is laid, take precautions to prevent it from being damaged. Minimize play and foot traffic for at least three weeks. Plan for watering needs before you lay sod, not afterward. Insufficient water is the leading cause of new-lawn failure—and over watering is not far behind. Water at least twice a day, including once during midday. Keep the soil moist to a depth of 1- to 2-inches. Check, however, to be sure that the soil does not stay saturated for long periods; otherwise the sod may not root. Reduce watering frequency to every second or third day once the sod begins new root growth (about two weeks). After four weeks, a sodded lawn can survive longer periods without water. Do not mow a newly planted sod lawn for at least 10 days after installation and not until the grass has begun to grow vigorously. Once again, if you use a rotary mower, set the throttle low to avoid lifting and chopping up pieces of sod. Finally, do not fertilize new lawns for at least six weeks. Then, a light fertilization of 1⁄2 pound nitrogen per 1,000 square feet is recommended.